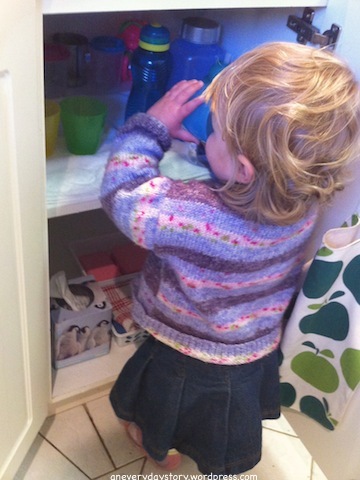 A couple months back I cleaned out a kitchen cupboard and made a little space for Sarah (16 mths). It was good in theory but in reality, Sarah wanted to use the bowls and utensils in Jack’s (3.5yrs) space. She wasn’t particularly interested in using her space. And since the pantry was set up to foster Jack’s independence, I spent a lot of time redirecting Sarah to her cupboard. It just wasn’t working. So with a little reshuffling we now have a space the two of them can share. The kids have had a shelf in the fridge for some time now. 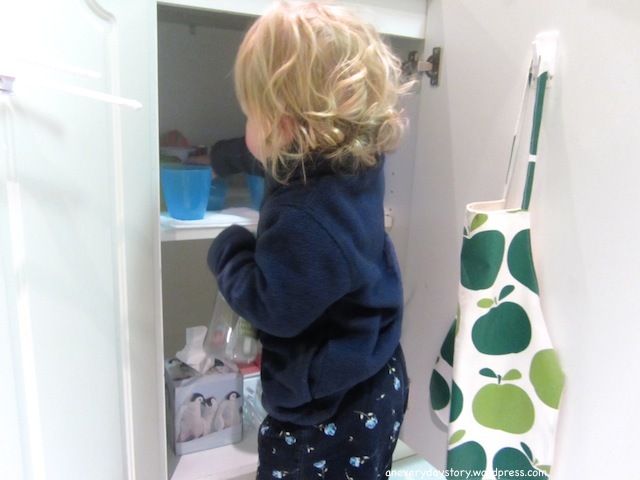 Jack is able to open the fridge by himself and help himself to a snack. Sarah is not yet able to do this but with some help she is able to choose what she wants. Having the food washed and chopped is a big help. Jack gets a lot of practice in other places washing and chopping (like when he is helping me prepare lunch and dinner) so I like that at snack time he can quickly and easily get what he needs. 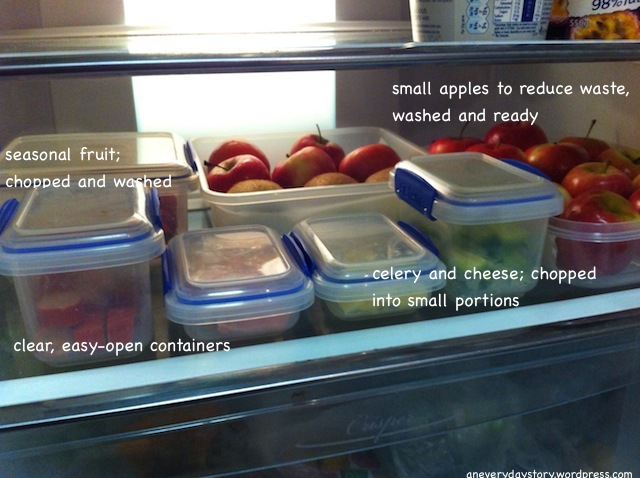 It also makes it easy when we are heading out, to grab a few containers and put a quick snack together (we are more often than not running late). 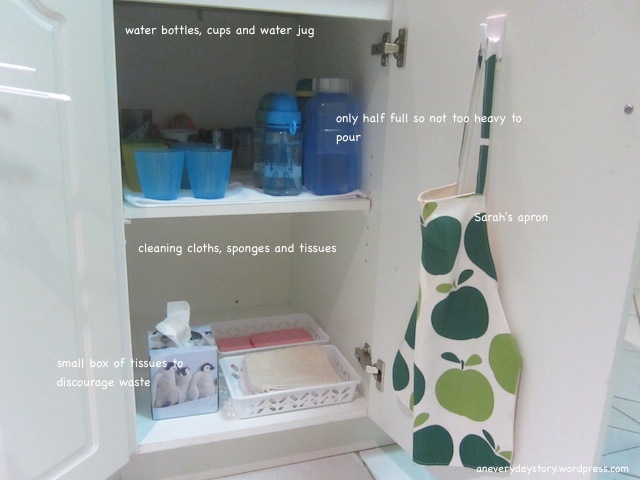 I like having a place for everything (my husband jokes that I am a ‘container-holic’). But I think it makes it easy for Jack and Sarah to find things and then return them when they are finished. Having Jack’s chopping board down near the bowls gives him a place to prepare his snacks. Sarah’s old cupboard now has a place for drinks and a shelf for cleaning cloths. This set up seems to be working much better. The shelf with the drinks has a small towel underneath to catch any spills. The photo above was taken with my iPhone. I was preparing something in the kitchen when Sarah walked in, open the cupboard and poured herself a drink. We haven’t given her any explicit pouring activities, she just picked this up from watching I guess. This was the first time I noticed her doing this; it really made me smile. 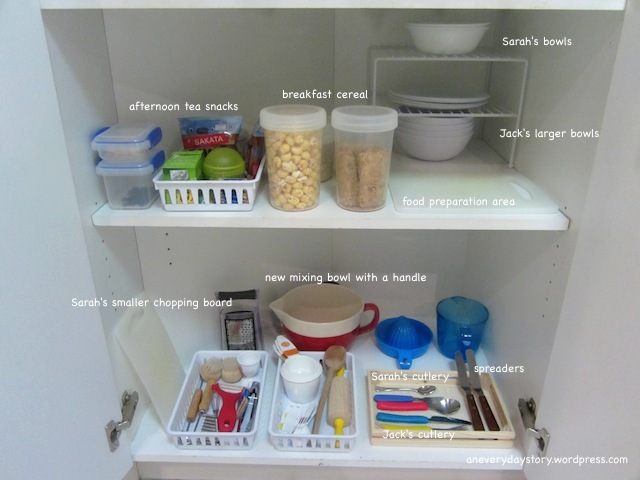 If you’re thinking about making a space in the kitchen for your children I have put together some simple questions to consider in the Getting Started: Montessori page. I think I have a space to start doing this. I bet it means so much to them to have the freedom and to be a participant . Very cool! It means the world to them! The child’s quest is to adapt to the world they where born into, you can help them by adapting the environment they live in. I like what you have done for your boys. Just some little changes can make such a difference. This post is so inspiring! Thank you for sharing! I thought I had done all I could in the kitchen for Cam but this has helped me realise that more re-organizing would be useful for him. She’s just learned to open the fridge so I think some chopped fruit/snacks on a low shelf is a great start! Why thank you Bek 😀 It is really great having space for them in the kitchen. Can’t tell you how much stress it has relieved having the kids able to get their own drinks and snacks. Jack even gets up in the morning and prepares himself breakfast all while we are still in bed! My son would finish with his water & dump what’s left in the cup on the floor,.carpet etc…I know its only water but too many times daily can add up to a stressful day sometimes. how do you avoid the dumping? I’ve read a lot of your posts and I have liked the simple way you just explain what you are doing with your kids. It has inspired me as I figure out what to do with my two little ones. Anyway. I thought you should know that your last link right now may be broken. thanks for taking the time to blog.